There are so many misconceptions about Montessori. Some people say, "That's where the children are allowed to do exactly as they like." Others say, "It's too rigid – the children have to work all the time and have no time to socialize." The reality is that Montessori is neither of these. While you may think that Montessori education is a method, it is really more an approach to life, growth and development. 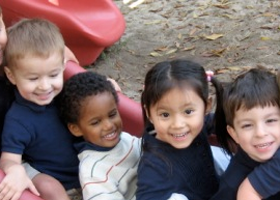 For 100 years Montessori has educated generations of children all around the world. Maria Montessori herself was a keen observer of children and how they learn. Her method and conclusions were ahead of their time, but within the context of today's enlightened educational approach, they are at the cutting edge of where education is heading. Maria Montessori believed that the child on whom this "burden of education" falls has a nature quite different from that of an adult. While the adult has reached the norm of the species, the child is a being in a constant state of metamorphosis, creating for themselves, the person they will become. She concluded that the environment in which a child evolves, will shape them just as surely as their genetic inheritance. Montessori has achieved success throughout the world. The role of the teacher is to be an invisible guide. Each child is taught both individually and in groups. Mixed age groups offer the opportunity for responsibility. Children respect one another and their surroundings. Each child has the opportunity to reach full potential. Montessori is a dynamic ‘whole-brain’ experience. Montessori teaches decision-making and self-confidence. Children learn to be independent problem-solvers. Skills learned in a Montessori classroom remain for life. If you are parent of one of our students, please leave us a review! We appreciate hearing from you to see how we can improve. If you are interested in enrolling your child, or have any questions about our Montessori, please feel free to reach out to us today.